Pink is definitely my favorite color and it compliments my summer tan. I'm obsessed with deep plunge sweetheart necklines this season. 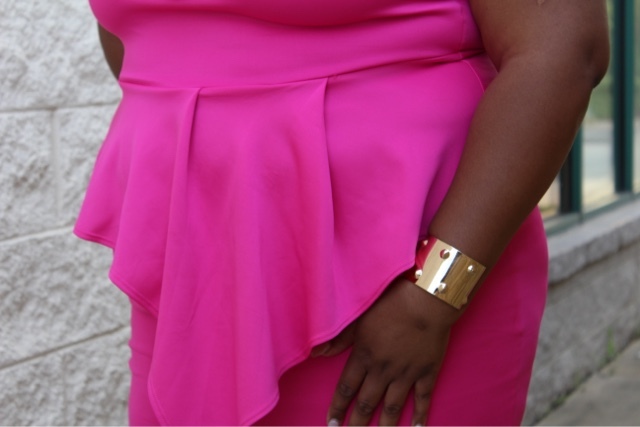 This flirty peplum dress is the right amount of feminine and glam for a night out. I paired with my favorite lace booties (these are my second pair). I get so many questions on Instagram about these shoes, which are actually exotic dancer shoes I found on Amazon last year. I experimented with a new hairstyle - Cherokee braids. This cornrow braiding technique begins with the root of your own hair and the braiding hair is blended in. It's a perfect protective style for all of the naturalistas out there and perfect for summer vacations. Hope you enjoyed my look! This dress is a bomb! The color fits you so well! Can you do a blog on foundation (undergarment). Which do you prefer?